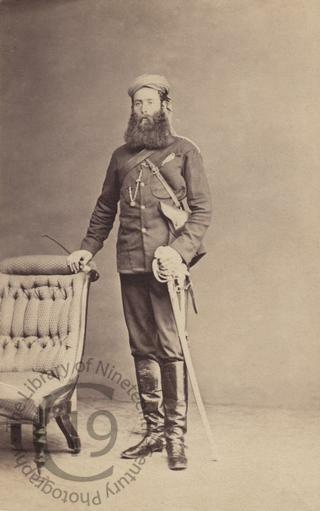 A carte-de-visite portrait of Lieutenant Samuel Masters Davies (1836-1885), an officer who served in the Military Train (formerly the Land Transport Corps, later the Army Service Corps). He is listed in Hart’s Annual Army List (1867) as a Lieutenant. Born on 5 January 1836 at Oystermouth near Swansea in Wales, he was the eldest of the four sons of Samuel Davies, the Vicar of Oystermouth. His mother was Mary Ann née Masters. On 2 March 1871 at St Stephen’s Church in Dulwich he married Josephine Marie Constance de Longueville. Born at Fort William in Calcutta, she was 19 years old. Samuel was 34. In 1876 Samuel filed for a divorce, claiming his wife had committed adultery with various men, names unknown, in a variety of places, including a cab on the road between Beckenham and Robin Hood Hill and in a railway carriage between Crystal Palace and Victoria Station. There had also been adulterous trysts at the Charing Cross Hotel, in a house in Jermyn Street, in Brighton and with a man she’d met at London Zoo. Mrs Davies had, in addition, spent an entire month in 1875 cohabiting at a hotel in Portsea with the only named co-respondent in the petition, John Knox Ruttledge, an Irish army captain much nearer her own age. Samuel was claiming damages from Ruttledge to the tune of £5000. Mrs Davies, for her part, made counter-charges against Samuel of neglect, cruelty and adultery. Ten different instances are cited in her affidavit, including one occasion when he ‘came home late in a state of intoxication’ and ‘shook her and kicked her and knocked her down the stairs’ and another when he ‘attempted to strangle her.’ His extramarital affairs were conducted in less comfortable circumstances than hers, mainly at the Crooked Tree in Penge and several times in a field behind the Robin Hood Tavern, another public house near the matrimonial home. The divorce was granted but Samuel wasn’t awarded any damages, since it hadn’t been proven that Ruttledge knew Josephine was a married woman. Josephine and Ruttledge were married in 1878 but two years later she was back in the divorce courts. That petition failed and three years later Ruttledge tried again, this time citing two co-respondents instead of one. Samuel Masters Davies ‘late of the Cedars Rickmansworth in the County of Hertford’ died at St Thomas’s Hospital in Lambeth on 27 November 1885. The cause of death was 'alcoholic sclerosis of [the] brain and spinal cord.' He left a personal estate valued at £12,326. Photographer unidentified. A pencilled inscription verso in a period hand reads: 'September 1864 / Field dress / New Zealand'.